[SHIFT-IT Coach] Two Feet in One World – Finally! Welcome to your October SHIFT-IT e-Zine. Well, I’ve hit a milestone – I’ve got both my feet now firmly planted in my SHIFT-IT Coach world! For several years I’ve had a foot in both my worlds (one in my SHIFT-IT work and one in my work as a strategic planning facilitator and change management consultant). Last Friday I fulfilled my last group job – working with over 70+ teachers on a school change project. 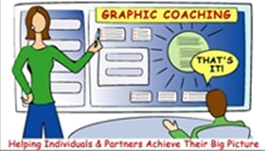 From now on I’m referring leads for graphic facilitation and graphic recording work to my new Preferred Partners Network (some of whom are listed on my makemark resources page). So I can bring all of my heart, soul and attention to my SHIFT-IT graphic coaching and law of attraction practice. For the next year or so I will continue to offer basic trainings in graphic facilitation and graphic recording – so I can transfer these rare skills into other practitioners. There are just a few spaces left in my Fall trainings ( I believe there is one space left in MG 101 and perhaps 2 spaces left in The Graphics Bootcamp – a little last minute re-arranging going on). So if you are interested in adding these valuable graphic group skills into your toolkit while you still can, please come join us in Oct/Nov – its going to be a blast! In January, due to expressed interest from my past SHIFT-IT clients, I’m launching “Merkley’s LOA Mastermind”, a six month tele-group program for people who want to seriously boost their understanding of Law of Attraction (LOA) and sky-rocket their manifestation results. I’m beginning the planning and curriculum development process of this right now – so details will be released in upcoming e-zines and on the blog. So stayed tuned if this is of interest to you. Last but not least, if you are attending the International Forum of Visual Practitioners Conference in Santa Fe this month, I hope you will join me for my session entitled: At the Crossroads: Graphic Coaching and Law of Attraction Essentials for Visual Practitioners. I’m going to demo some of my favorite SHIFT-IT moves (Magnetism Map and Flip It) and work with my colleagues on belief and mindset issues to help them grow their practices and prosperity and flip erroneous beliefs around creativity, money and living a life that you really, really like. I’ve never been to Santa Fe yet, so look forward to flying in and then taking a nice, leisurely road trip back up to Canada – ready to do my workshops when I get back. Oct. 18-21, 2007: Int'l Forum of Visual Practitioners Annual Conference, Santa Fe, New Mexico. Workshop presentation: SHIFT-IT: Graphic Coaching and Law of Attraction Basics (3 hour session, Saturday afternoon). More Info. Oct. 31-Nov. 1, 2007: MEETING GRAPHICS 101 WORKSHOP (level 1): Introductory graphic recording and graphic facilitation skills for facilitators, consultants, trainers, coaches, managers and other process leaders and assistants. Foundational basics for the beginner. No art skills necessary. Possibly one space still left. More Info. 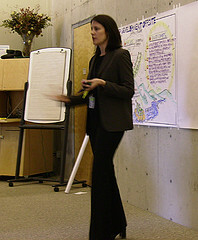 Nov. 2-3, 2007: GRAPHIC BOOTCAMP (level 2): More advanced instruction and experiential practice. Offered right after MG 101 for those traveling from afar. Lots of at-the-wall drills. Demos. Template construction. Recording and facilitation practice. Advance icon library. Plus business and sales instruction- how to market the benefits of working visually. Possibly two spaces. More Info. This week I celebrate and relinquish an old identity and step fully into a new one – and boy does it feel good! After 12+ years as a strategic planning facilitator, change management consultant and graphic mapmaker – I am ‘folding up my flipchart stand’ so to speak, in order to focus exclusively on my SHIFT-IT graphic coaching and law of attraction practice. So, in this article, I’m going tell you how I made my own shift, so you can apply the same SHIFT-IT principles to your own career and lifestyle change. In my experience, the best thing you can do is to follow what feels good to YOU – like breadcrumbs leading you on a path through a forest. It can be scary, and the big picture certainly isn’t always clear, but with some thoughtfulness and visionary planning, things will eventually work out and you will be very glad that you stuck with it. I did a general arts degree (English/Sociology), back when the naysayers said a BA was useless – because I liked to read, write and think about cultural influences (skills I continue to use 20 years later). I left Canada and went to an alternative grad school (CIIS) in San Francisco, on Ashbury Street no less, because I was fascinated by the Organizational Development & Transformation program there that allowed me to explore and create as no other program of the day would (despite warnings from more conservative friends and family that I would kill my chances of an honorable corporate career and stereotype myself as a flake or weirdo). 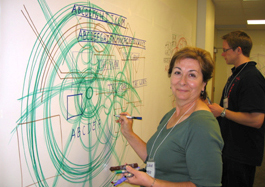 I studied graphic recording and graphic facilitation, hypnotherapy, coaching, voice dialogue, energy work, law of attraction and many other unique methodologies beyond my business and change management interests because I was authentically attracted to these wonderful areas. Not because any one else thought they were valuable or worthwhile but because I did ( in fact my banker / lawyer ex thought I was ‘Dharma’ to his ‘Greg’ and pretty much pooh poohed my choices). I guess what I am saying, is that it is not always easy, and you may face pressures from others and from yourself – but in the long run do follow what YOU like to do and what you are naturally attracted to. There is more than one way to be successful in this world. You do not have to follow standard, traditional routes to be a success. Its an abundant world with lots of ways for you to connect with others who share and value your unique interests. You may not immediately know the ‘how’ around how to create work and life around the things that bring you the most joy but you can begin to create a ‘feeling good’ vision of your desired end state – and that Vision is far more important than a bunch of unaligned action. Your main work at the beginning stage of things is to find the ‘feeling place’ of what you want. Imagine yourself in a life that feels good to you. Having abundance, success, relationships and whatever it is that rings your particular bell. Way back in grad school, over a decade ago, I began to formulate a vision of having a cool, creative company where I would work deeply and personally with people. Where I could live my values and employ my skills in my woman owned business – where people would come to me (instead of me having to constantly travel). Where I could combine head with heart. Masculine with feminine. The yin with the yang. I didn’t have all the particulars worked out, but I did have the general feeling state of what I wanted to create – and from there the details worked themselves out. Now, a decade later, I am living the reality of what I once dreamed. Once you develop a Vision, you will get inklings about how to proceed. Different resources, options and steps will start to show themselves. You’ll attract mentors, methodologies, and materials that resonate with you and what you want to create. Your path, like mine, may take years to complete. The bigger the vision, the more time it might naturally take to manifest it. And the more personal changes, re-structuring and investments you may need to make. And that is ok. Learn to breathe, pace yourself and find ways of making the journey itself enjoyable. As my Law of Attraction teachers, Jerry and Esther Hicks say – you are eternal beings and you never get it done. So relax, settle in for the long haul and learn to be ok with ongoing, incremental manifestations that eventually add up to what you want. One of the biggest incremental shifts I have made in my business the last few years is to train out my ‘old’ expertise and process-ize and product-ize my unique, passion-work knowledge. I began working visually with individuals and partners during grad school, even did my thesis project around it. In the decade plus since, as a result of all those hours and years of experimentation, a well-honed process (The SHIFT-IT Graphic Coaching Process®) has emerged. I’ve trademarked that process and have created useful tools and products around it – so more clients can access my work and so my work is made easier ( I love using my tools with my clients – now I can easily send them SHIFT-IT maps and booklets – so we move quickly and more efficiently through the process and the keeners can work as fast as their own pace dictates). There was a significant upfront investment in time and resources to create my products – it was a lot of work! However I am still tickled with my tools and the responses they get and it is wonderful to have reached that ‘coasting’ energy on the other side of the hill. And, in addition to creating a new process and related products, I have also opted to ‘train out’ my older, base skills (graphic recording and graphic facilitation). What started as a small 1.5 hour skills session several years ago has grown into a very satisfying alternative revenue stream for me via my workshop series. I have always enjoyed training and mentoring others in these rare skills and now I get respectably acknowledged and paid for it, by folks all over the world who travel to me. Its really a wonderful win-win collaboration. This might be something that you can do too, as you shift from one area of work to another. What knowledge have you accumulated over the years that others might be interested in obtaining? What tricks of the trade, contacts and recourses, business development, and mentoring support might you be able to provide in work that you have done for years that you no longer want to grow for yourself? Makes a nice segue as you transition from one world to another. The single most important thing I have done for my life and for my career is to learn about the Law of Attraction (LOA). About six years ago - a couple of years into my transformation journey – an acquaintance introduced me to the concept of LOA. I was complaining about a job I was in and a relationship I was in (the aforementioned ex) and she literally grabbed me by the arm and told me to ‘stop!’ – and told me that I was unknowingly perpetuating my misery by the way I was acting. I’ll admit that I was a little miffed and put off at the time – thinking she wasn’t being very understanding or supportive. She gave me some literature (Abraham-Hicks on the Science of Deliberate Creation), which I promptly stuck in a box and forgot about for a while. But in time, and certainly now with the hindsight I have, I am eternally grateful for the intervention she played out on me. The Law of Attraction, par none, as been THE most important learning I have ever done. It has literally changed my life and now the lives of people who are attracted to work with me. In order to Become Your Next Self, you may need to make personal changes, and some of them can hurt and be painful – at least in the short term (and until your LOA work pays off). While I am very grateful for my own path, it hasn’t always been an easy one. In order to become who I now am, I have had to make significant changes that some people (particularly those who envy me from a far) don’t know about or recognize the significance of. I have ended relationships, changed geographies, undergone drastic dips in income and have come out a much different person from how I initially was. Don’t let other people’s PR fool you. The success path isn’t always an easy one. There may be some adjustments and prices to be paid. And, while there are prices to be paid, it is much less a price than living a unlived life – at least in my opinion. Your transformation process might not be as drastic or dramatic as mine has been (for your sake I hope not! ), but some things may be tough for a while. Some people (friends, family, colleagues, etc) will not take kindly to your changes. They like you to stay and remain how you are. When you change, you provoke things within them – things that they don’t care or wish to look at. Change can understandably be very uncomfortable for a lot of people. So please don’t think that transforming and SHIFTing IT is always a bed of roses. It hasn’t been for me and I don’t want to leave you with a false impression of it always being easy. But I also don’t want to leave you with feelings of pessimism either – as I would do it all over again if I had to (just perhaps with a little more finesse now that I have my LOA skills to smooth things out and pre-pave the way!). Fun Session with the A.W.E. Congratulations to The Grove on Their 30th!